Sen. Bernie Sanders (I-VT) at a health care rally in San Francisco, California on September 22, 2017. Photo by Justin Sullivan/Getty Images. In April 2017, the Democratic Congressional Campaign Committee (DCCC) wanted to find out the best way for its candidates to address the topic of health care, so it hired two research firms to conduct internal polling focused on 52 battleground districts expected to be close races in 2018. Stan Greenberg, a pollster and founding partner with Greenberg Quinlan Rosner Research (GQR), presented his findings at the offices of the Democratic National Committee and suggested that Democratic candidates should focus on the flaws of Republican plans and offer “Proactive Solutions (only if asked),” as The Intercept reported. 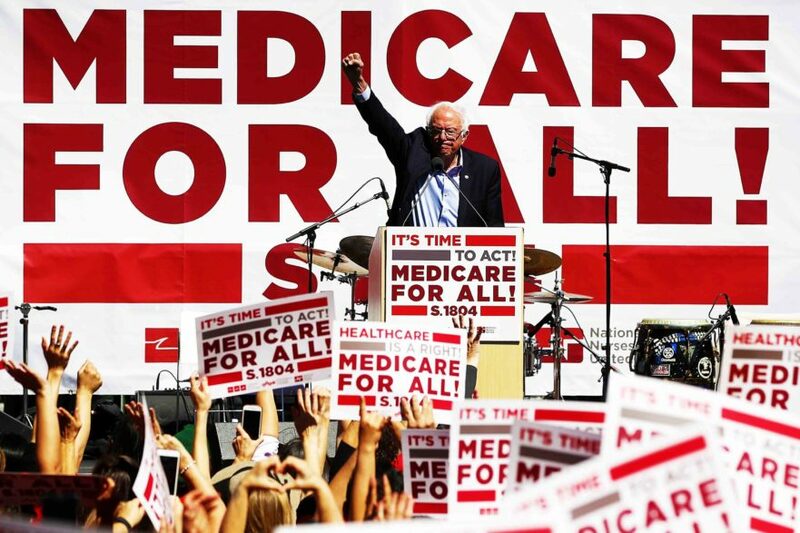 While “single-payer” never made it into the proposed talking points compiled in its memo, GQR listed numerous “likely Republican lines of attack” against Democratic House candidates over Sen. Bernie Sanders’ Medicare for All bill, which has 15 Democratic cosponsors. (Medicare for All is a form of single-payer health care.) The memo offered no suggestions for how to counter these criticisms. Polling on the issue, however, suggests otherwise. One poll from September found that 52 percent of Americans favor single-payer health care, and 69 percent of Democrats support such a policy. On behalf of UnitedHealth Group, Elmendorf has recently lobbied Congress on a health insurer tax that is part of the Affordable Care Act. Earlier lobbying records detail the company’s goal: “to repeal or delay” the tax. In January, the tax was delayed one year and will not go into effect until 2019. Elmendorf also represents kidney health care company DaVita, having recently lobbied Congress on “issues related to Medicare payment for End Stage Renal Disease (ESRD) and Medicare Advantage.” Subject Matter’s other corporate lobbying clients include Facebook, Ford, Goldman Sachs, and Verizon. Neither Elmendorf nor the DCCC responded to TYT requests for comments. and $1,000 to Rep. Scott Peters (D-Calif.), the centrist chair of the New Democrat Coalition PAC who proposed an Obamacare fix with the bipartisan Problem Solvers Caucus. Elmendorf also donated $1,500 this cycle to the campaign of Sen. Debbie Stabenow (D-Mich.). Although Stabenow has introduced legislation to lower the Medicare eligibility age from 65 to 55, she has not come out for Sanders’ bill. Disclosure forms show that many of the Democrats Elmendorf supports are also supported by the political action committees of companies and industries that would be threatened by Medicare for All, including some of Elmendorf’s lobbying clients. The UnitedHealth Group PAC has donated $4,500 to Kennedy’s 2018 campaign, $4,000 to Peters’ campaign, and $2,500 each to Kaine and McCaskill’s campaigns, according to data compiled by the Center for Responsive Politics. The PAC of America’s Health Insurance Plans, a health insurance trade organization, gave Peters’ campaign $1,000 last year and donated $5,000 to the New Democrat Coalition PAC and $5,000 to the conservative Democratic Blue Dog PAC. DaVita PAC is also a frequent campaign donor, and has contributed to the campaigns of McCaskill ($5,500), Kaine ($2,000) and other moderate Democrats during this election cycle. As the DCCC was discouraging House candidates from backing Medicare for All, the committee also went after a progressive Democrat who supports single-payer health care. Earlier this year, the DCCC took the extremely rare step of publishing scathing opposition research against Sanders-aligned Texas congressional candidate Laura Moser, who backs single-payer. Moser’s opponent in a runoff election to represent the 7th Congressional District is Lizzie Pannill Fletcher, who does not mention single-payer or Medicare for All on her campaign website. Sanders, who has said he had to take on the Democratic National Committee in the 2016 presidential campaign, called out the DCCC’s attacks on Moser. “That just continues the process of debasing the Democratic system in this country and is why so many people are disgusted with politics,” he told the AP. Alex Kotch is an investigative reporter whose work has previously appeared in International Business Times, Vice.com, and Exposed by CMD. Follow him on Twitter. Medicare for all is a threat to the Price System. It puts control of health policy to the Doctors, Pharmacists, and Researchers instead of accountants, corporate bureaucrats, financial elite who serve nobody but themselves. I want people who spent their lives learning and applying scientific knowledge in Health to be in charge of health care policy. End this corrupt system and install Medicare for all NOW. Anyone who opposes is just a corporate tool. I fully agree with David. Rep Joe Kennedy on most recent Jimmy Kimmel shoe twisted in the wind when asked by Kimmel about his opposition to single payer/Medicare for all. Sen. Tim Kaine (D-Va.), Sen. Claire McCaskill (D-Mo. ), Rep. Joe Kennedy (D-Mass. ), Rep. Scott Peters (D-Calif.) all takes the bribes and would be in jail if it wasn’t for our corrupt system and would be great candidates to be primaried by Justice Democrats or Our Revolution and this one bribe would cause them to lose. There is no doubt how phony and corrupt they are. In all cases voters only need to find out where a candidate’s money comes from.